An entire generation of young Christians--along with millions of older believers--is confused about what they believe, why they believe it, and how it's relevant. The Unshakable Truth Journey� Growth Guides are a series of 12 courses designed especially for churches, church classes, and small groups. They get to the heart of what being a true follower of Christ means and what knowing Christ is all about. Each five-session guide is based on one of 12 core truths of the Christian faith presented in Josh and Sean McDowell's book The Unshakable Truth�. Orthodox, hard-hitting, and relevant, these guides are uniquely positioned for today's culture because they highlight how Christianity's beliefs affect relationships; promote a relational, group context in which Christians can experience the teaching in depth; and show believers how they can live out Christianity's central truths before their community and world. More than just a program, The Unshakable Truth Journey� Growth Guides are a tool for long-term change and transformation! 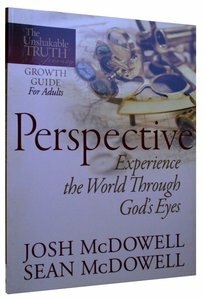 Perspective--Experience the World Through God's Eyes focuses on the truth about God's kingdom and how it gives us a new perspective--a biblical worldview. We can experience the kingdom here and now as we grasp how it affects our view of our world. About "Unshakable Truth Journey: Perspective"